"Jagdhaus Schönau an der Brend" from 1912, which you have with 2500sqm garden and 400sqm living space all to yourself. Our house is family run. We are directly and reliably accessible to you. They are personally received and adopted. 10 bedrooms, (8 double rooms, 1 2-3 bed room, 1 single room), 2 kitchens, 4 bathrooms (6 showers, 3 baths) .With Wi-Fi, washing machine, dryer dishwasher, 3 refrigerators, 2 stoves / ovens, stereo m. USB, TV has the greatest comfort. High quality, comfortable mattresses, well-kept bedding. In the middle of Germany, very quiet, it is with exclusive facilities and infinite space for your family reunion, your well-groomed celebration, or simply for a quiet and romantic holiday in the hiking and cross-country paradise Rhön. You arrive and can relax: the house is pre-heated in the cold season. For the children are toy boxes (wooden train, Lego u. V.m.) ready. At your doorstep you can start walking. 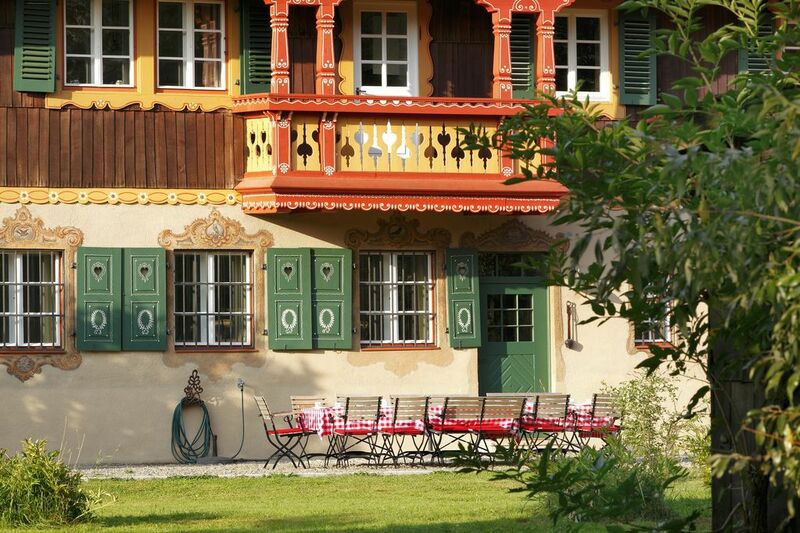 The Grade II listed hunting lodge in Schönau ad Brend can accommodate 20 people, but can also be rented from 14 people, the rental price will be adjusted accordingly. A dream home for family reunions, holidays with friends or kith and kin - and the dog must with too! The unique facilities with old tile and iron stoves, wood floors, murals, hunting trophies and old pictures produced an incomparable holiday feeling. The comfort of 2 perfectly equipped kitchens, 4 elegant bathrooms with 6 shower facilities, 4 toilets, a new central heating and WLAN satisfy even the highest demands. Behind the house you can relax on the terrace, beautiful wooden furniture, umbrellas, 4 charcoal grills and 9 deckchairs are available. For children there are in the vast orchard swings, sandbox, sand toys, Bobby Cars, bicycles, and especially a lot of space. It is straightforward, the children can play football, climb trees and also sometimes loud. Everyone can find what he needs. Peace and seclusion to dive once. The day dream away in a deckchair under Quittenbaum. Or the area on the many and well-mapped bike trails to explore by bike. There are many opportunities for beautiful activities, cultural visits or hikes in one of the most sought after and most extensive hiking areas in Germany. For children and adults, the summer and winter toboggan run on the Wasserkuppe is very entertaining. In winter you can go skiing in the immediate vicinity and extensively cross-country skiing. For families with children the spacious space indoors and outdoors and provide the certainty that the little ones can frolic carefree in fully fenced plot, for relaxation. In the cooler days you can fire up a tiled stove, a pot-bellied stove and a wood stove, firewood available. Of course, it is also a new central heating. An exclusive house with many nice details such as candles and lanterns and high quality equipment. Well-kept white damask sheets, cream-colored towels and tea towels can be provided, many lovely little things create a beautiful atmosphere. The up to 2012 extensively restored listed building was combined with many antiques from the inventory and pretty new things. All beds have new high quality mattresses and bed bases. The bedding is new, washable and alllergikergeeignet. There are 1 large living room with several seating areas, TV and stereo. The dining room can accommodate up to 20 people at a beautiful table Place, next door at the hunting room to 6-8 people sitting at a table Rhon. Also on the terrace can sit 20 people comfortably and celebrate. For smaller groups, tables in the dining room can be set accordingly, so that nothing seems too big. The 2 kitchens are extensive and high quality equipped: large refrigerators, large pots, casserole dishes, goose roast, numerous serving plates, enough white dishes, elegant cutlery and neat glasses - here you can cook festively and beautifully, and under a painted angel choir (ceiling painting) surrounded by bucolic fruit troughs (mural) wonderful tables. This house is an art historical treasure trove, where almost everything is unchanged, as it was 100 years ago: built in 1912 in historicist style of a Swiss chalet, with Lüftlmalereien on the facade and in the interior over and over painted. In the sumptuous entrance area greets a prepared Auerhahn from the wall, beautiful are the carved coat hooks and painted grandfather clock. Comfortably the lamp Rien, the old doors, original fittings, casement windows and authentic floorboards. The house has been awarded a monument price of Hyypo Cultural Foundation 2012 Design. Rhoen for a winter wonderland. Evening paddles turncoats in the meadow, martens and squirrels komen to visit, and quiet it is here anyway. A house for dreamers, hikers, nature lovers, and all those who love the beautiful. 4 bathrooms with 6 showers, 3 sinks, 4 toilets. All bathrooms are equipped with natural light, generous and elegant. Magnifying mirror, hair dryer, children's toilet seat and children's podium available. They were completely rebuilt in 2011. We place great emphasis on comfort for toddlers and their parents. The house has 7 high chairs. We also provide 3 baby cots, 3 bed rails, 3 changing mattresses, 3 bathroom petticoats and baby blankets. 3 toy boxes are ready. In the garden house there is a beach shells, a lawn sprinkler to Keep the fun in summer, Hüpfpferde, scooters, and sand toys for the sandbox. The entire property is fenced. Children can play in the large garden Running, hiding, climbing trees, and have always something to discover. ...alles wie erwartet, eine schöne location für schönes, aber auch nicht so schönes Wetter...Küche von einer Köchin oder einem Koch ausgestattet: es ist alles da, was das Herz begehrt, genügend Geschirr sowieso. Daaaaaaanke!!! Wir haben ein tolles Famielienwochenende mit Großeltern, Kindern, Enkelkindern und Freunden genossen. Das alte Jagdhaus bietet ein phantastisches Ambiente, viel Platz für alle und ist für große Familienfeiern großzügig und perfekt ausgestattet. Von Geschirr und Küchenausstattung über Gartenmöbel bis hin zum Kinderspielzeug für drinnen und draußen- es hat an nichts gefehlt! Wir haben mit insgesamt drei Familien das Jagdhaus gebucht und waren sehr zufrieden. Das Platzangebot ist mehr als ausreichend, das Haus ist toll ausgestattet und der Garten hat den Kindern viel Platz zum Toben geboten. Nach einem sehr freundlichen Empfang haben wir das Wochenende sehr genossen und würden das Haus jederzeit wieder buchen. Wir hatten das Haus für ein Wochenende für ein Freunde-Treffen gebucht und sind wirklich begeistert. Die Absprache im Voraus hat super geklappt, wir wurden sehr herzlich empfangen und das Anwesen ist wirklich sehr schön - sehr gepflegt, sauber, toll ausgestattet und mit ganz viel Platz für unsere große Gruppe! Ich würde es jederzeit wieder buchen! Das Jagdhaus ist einmalig und wir kommen garantiert wieder. Leider hatten wir nur 2 Tage in diesem wunderschönen und sehr liebevoll restauriertem Haus verbringen können. You are on holiday in the Rhön, in the land of the open distance. One of the most popular and beautiful hiking regions in Germany. Due to its guaranteed snow and numerous good lifts, you can spend a pleasant winter sports holiday here. Winter hikes and guided snowshoe tours (even at night!) are just wonderful here. Schönau is a pretty Rhöndorf with half-timbered houses and a beautiful church. The house is very quiet on a barely traveled road, behind the house is the huge garden with terrace. Already from the hunting lodge you can take wonderful hikes and walks. A small grocery store is located in the immediate vicinity of the house (300m), gastronomy is in place, u. a. a spa hotel with a public restaurant and spa, which is also open to non-hotel guests. The heated outdoor pool in the village with Spielbach for children is 500m, right next door is a natural pond for swimming. 500m there are also the nearest trail and two guided hiking trails u. a. to the Wasserkuppe. At the Red Moor (about 9 km) is an excellent cross-country ski center with cross-country trails of varying difficulty and lengths. 8 km there are several ski lifts at Bischofsheim am Kreuzberg, more lifts, magic carpet for children and a long, great toboggan run can be found on the Wasserkuppe (about 24 km). There is also the popular summer toboggan run. The next fun pool for winter and summer can be found in Bad Neustadt (12km), other very nice bathrooms with extensive wellness facilities in Bad Kissingen, Bad Brückenau, Bad Königshofen or in Bad Bocklet. The famous and beautiful hiking areas of the Rhön are only a few kilometers away. For anglers there is the possibility to solve day tickets in Bischofsheim for the Brend for the trout and grayling. Soaring, hang gliding and paragliding are also possible at the Wasserkuppe. For children there are endless opportunities to make beautiful trips: visit castles, steamboat rides, the Red and Black Moor, the open-air museum Fladungen or the Wildpark Gersfeld. Information material for activities you will receive from us before your arrival. It is worth bringing a hiking guide. Gastronomy guides can be found in the house.